EPRA is governed by a Board of Directors, who meet at least three times a year to advise and guide EPRA’s activities. The Advisory Board acts as a supporting body of the Board of Directors. Rolf Buch has served as CEO of Deutsche Annington since 1 April 2013. Prior to that, Rolf Buch acted as management board member of Bertelsmann SE and as CEO of Arvato AG. During his time at Arvato, the company grew into a global BPO service provider with more than 60,000 employees in over 40 countries and has developed into the fastest growing business division of Bertelsmann SE. Rolf Buch had studied Mechanical Engineering and Business Administration, he started his career at Bertelsmann in 1991. Rolf Buch is married and has two children. Robert Noel, was educated at Marlborough College and Reading University. From 1992 to 2002, he was a Director of Nelson Bakewell Ltd, the property services group. He joined Great Portland Estates plc, the FTSE 250 REIT, in June 2002 as part of a new management team, and was appointed to the Board in August 2002. He joined Landsec in January 2010 as Managing Director of its London business, and was appointed Group Chief Executive from 1 April 2012. Robert is a Trustee and Director of LandAid, the property industry charity, and on the policy committee of the British Property Federation. He is a Past Chairman of the Westminster Property Association and formerly a Director of The New West End Company, the central London business improvement district. Robert is married, with three children and lives in central London. A business leader in the real estate industry, Méka Brunel is an ETP engineer, FRICS and has an executive MBA from HEC. From 1996, she held various executive management positions with Simco, which later merged with Gecina. In 2006, she became CEO of Eurosic, before joining Ivanhoé Cambridge in 2009 as Executive Vice President in charge of real estate operations in Europe. She has been a Director at Gecina since 2014 and was appointed as its Chief Executive Officer in January 2017. Actively engaged in community life and industry associations, particularly as a Director of Crédit Foncier de France, Honorary President of the HQE-France GBC association, a Director of FSIF and EPRA, Méka Brunel was also named Professional of the Year in the 2013 Pierres d’Or awards. Chairman of the Management Board and Chief Executive Officer. Prior to joining Unibail-Rodamco-Westfield, Mr Cuvillier held various positions within the Kering Group (formerly PPR) from 2000; including CEO of FNAC (2008-2010) and CEO of Conforama (2005-2008). Prior to Kering, he spent 14 years in the Luxury Products Division of L’Oreal, both in France and abroad including 8 years in senior management positions. Mr Cuvillier became member of the Management Board and Chief Operating Officer of Unibail-Rodamco-Westfield on June 1, 2011. He held this position until April 25, 2013 when he became Chairman of the Management Board and CEO. Born in 1962, Christophe Cuvillier is a French national and a graduate of HEC. Helen Gordon is Chief Executive of Grainger plc the UK’s largest listed residential landlord. Helen was appointed Chief Executive of Grainger in January 2016 from RBS where she had been Global Head of Real Estate Asset Management since October 2011. Prior to that Helen was Director of Legal and General Property, responsible for the Main Life Fund and c.8 smaller Funds, and Group Property Director of Railtrack and Managing Director of John Laing Developments. Helen has held a number of non-exec positions, Government appointments, and is currently on the Board of Covent Garden Market Authority and was a Trustee for The College of Estate Management for nine years. Chris Grigg joined British Land as Chief Executive in January 2009. He was Chief Executive of Barclays Commercial Bank until November 2008, having joined the bank in 2005 as Group Treasurer. Prior to Barclays, he held a broad range of leadership positions at Goldman Sachs, where his career spanned 20 years. He rose to partner of Goldman Sachs, working principally in its capital markets and derivatives business. Chris is a member of the Executive Board of the European Public Real Estate Association. In July 2011 he was appointed Vice President of the British Property Federation and becomes President in 2012. Jean-Pierre Hanin has a licentiate degree in Law from the KUL (Catholic University of Leuven). He also holds a Master in Tax Management from the Solvay Business School and a LL.M from Georgetown University. He started his career as a business lawyer. He then joined various international groups where he took up financial and management positions, among which Chief Financial Officer and Chief Executive Officer of Lhoist Group, global leader in lime and dolime. More recently, he was Chief Financial Officer then manager of the Building Performance division of the construction materials group Etex. His functions led him to operate in various regions all over the world for over 20 years, and to carry out both consolidation and development activities. Prior to his appointment as Chairman of the Executive Board, Jean-Marc Jestin served as Chief Operating Officer and Member of the Klépierre Executive Board since October 18, 2012. Previously, he held various positions in real estate companies. He was notably Chief Financial Officer and then Chief Operating Officer of the pan-European platform Simon Ivanhoe from 1999 to 2007. He then joined Unibail Rodamco’s International team, acting as Deputy Chief Investment Officer in charge of acquisitions, sales and M&A transactions. Jean-Marc Jestin started his career in 1991 at Arthur Andersen in an Audit function, where he contributed to the development of the Real Estate Practice. Jean-Marc Jestin, age 48, is a graduate of the HEC Paris business school. Patrick Kanters is Managing Director Global Real Estate of APG Asset Management. APG Asset Management is specialized in managing pension capital, offering asset management services to the pension funds of the government, education and construction sectors and housing corporations. Based in the Amsterdam office he is responsible for all real estate activities. The real estate holdings are concentrated in securities of publicly traded real estate companies and selected private entities, funds and co-investments in Europe, the Americas and Asia Pacific. Prior to joining ABP in 2005, Patrick worked for ING Real Estate for 11 years. Most formerly he was Managing Director of the Investment Management department covering the European markets. Patrick is member of the Board of Steen & Strom, the leading Scandinavian shopping center investor, operator and developer. In addition, Patrick is member of the Management Board of INREV. Patrick holds a MSc in Real Estate, Project Management & Housing from the Delft University of Technology in The Netherlands and received a post doctorate degree in Real Estate from the University of Amsterdam. Simon Robson Brown joined CBRE Clarion (then ING Clarion) in January 2006 and is a Portfolio Manager and Principal of the firm. Prior to this, he was part of the Property Equity Research teams at both UBS (2003-2005) and Citigroup (1999-2003). He qualified as a Chartered Accountant (ICAEW) with PricewaterhouseCoopers in 1999, having graduated from St John’s College, Cambridge in 1995. Henrik Saxborn is CEO at Castellum AB. Castellum is one of the major listed real estate companies in Sweden. The fair value of the real estate portfolio amounts to approx. SEK 87,5 billion, and comprises commercial properties. Mr Saxborn has been active on the Nordic property market over 20 years. He holds a Master in Science from Royal Institute of Technology in Stockholm (KTH) and has during the career been CEO of an Asset Management Company as well as a former Management Partner at the Private Equtiy Company, NIAM, during 1998-2005. From 2006 he has been deputy CEO at Castellum and responsible for the company’s business development. Member of Management Board and Executive Committee of AXA IM - Real Assets. Member of AXA IM Management Board. Isabelle Scemama is Chief Executive Officer of AXA IM - Real Assets and chairs the Management Board and the Executive Committee. Her responsibilities include the definition of AXA IM - Real Assets’ strategy and its day-to-day management. Prior to that, Isabelle was responsible for the Funds Group which includes CRE Finance, Infrastructure, Alternatives, Core & Value-Add funds and European Sales. Isabelle joined AXA IM - Real Assets in 2001 to head real estate fund structuring and financing. In 2005, she launched the CRE Loans platform which currently manages mandates of over €10 billion on behalf of AXA insurance companies and more than 40 institutions from 10 different jurisdictions. In 2013, she was appointed to launch the Infrastructure lending platform, an initiative managed on behalf of the AXA Group that aims to invest up to €10 billion in infrastructure loans. In 1995, she joined the real estate financing department where she was responsible for the financing of investors. Isabelle started her career in 1989 at Paribas in the large cap corporate financing department. She has 25 years of experience in financing including 19 years in real estate finance. Isabelle graduated from IEP Paris (Sciences Po) with a degree in Political Science in 1989. Pere Viñolas is a Graduate and Master in Business Administration (MBA) at ESADE, Barcelona. He’s also a graduate in business administration by the University of Barcelona, where he also studied Law. He has the Advanced Studies Diploma by the Universidad Complutense, Madrid. Pere Viñolas has been Head of Research, Chief Financial Officer and Dep. Chief Executive Officer at the Barcelona Stock Exchange. He has also been Chief Executive Officer at Filo, Barcelona, a listed real estate company that went into a successful turnaround. He’s been partner and Chief Executive Officer at Riva y Garcia, a Spanish independent investment bank. Member of the Board of Directors of Inmobiliaria Colonial, Societe Fonciere Lyonnaise, Grupo Mecanotubo, Riva y Garcia Investment bank, among others. Pere Viñolas is Chairman of the Barcelona District Council of the Urban Land Institute. He has been Chairman of the Catalan Foundation of Financial Analysts and Vice chairman of the Spanish Institute of Financial Analysts. He’s been member of the International Federation of Stock Exchanges and Chairman of the Supervisory Board of the Spanish derivatives market (MEFF). Pere Viñolas is Professor of finance at ESADE, Barcelona. Visiting professor at the Financial Studies Institute, Barcelona. He’s been in charge of the Real Estate Chair at ESADE, Barcelona. He’s author of different books and articles related to financial and investment analysis. James Wilkinson is BlackRock’s Co-Global Chief Investment Officer of the Global Real Estate Securities Group. His 18-year career in investment includes working at Thames River Capital and Henderson Global Investors as a real estate securities fund manager. Prior to this he was a Chartered Surveyor at Healey & Baker. Wilkinson joined EPRA’s Advisory Board in 2014 and a year later EPRA’s Board of Directors. Dominique joined EPRA as CEO in 2017, moving from BNP Paribas Real Estate Investment Management where he held the CEO position for Luxembourg and Belgium. After working in a private bank followed by five years as a management consultant on large financial sector projects for KPMG Consulting, he joined Fortis Real Estate in 2004, where he was COO for international investment and fund management activities in Luxembourg, Belgium and Spain until 2011, before moving with the company to the UK. Moerenhout is a native French and Dutch speaker and fluent in English. He holds a Master in Business Administration from ICHEC Brussels and a European Master in Financial Analysis (CFA) from the Belgian Association of Financial Analysts. Mr. Albertini, born in 1958, has been behind the wheel at IGD since May 2009, after having served as a company Director during the last three years. He matures more than twenty years of experience with the Unipol Group, where he ultimately acts as General Manager of Unipol Merchant. Mr. Albertini is a certified financial auditor, registered in Bologna. Mr Anbeek was appointed as member of the Management Board in June 2009. He was appointed as CEO of the Company in August 2012 and was reappointed in 2013 until 2017. From 2006 to 2009, Mr Anbeek served as director of Albert Heijn EVP Franchise & Real Estate and he served as Senior Vice President Business Planning & Performance from May 2004 to 2006. Furthermore, he held several international management positions at Ahold from 1996 and 2004. He was senior consultant at Pricewaterhouse from 1994 to 1995. In addition, he held several international management positions at DSM from 1988 to 1994. Mr Anbeek currently also holds the position of member of the supervisory board of Ordina N.V. and Detailresult Groep N.V.
Guillermo Baygual Ferrater is Managing Director and Global Co-Head of Diversified Industries. He joined J.P. Morgan in 1999 as a member of the European Advisory team, with a focus on the Spanish Market. He previously worked in Dresdner Kleinwort Benson and in Morgan Stanley, with focus on Spanish and Portuguese Advisory. In his 18 years of IB experience, Guillermo has worked on over 60 successful executions, including more than 10 ECM transactions and over 20 successful real estate and infrastructure transactions. Guillermo has a Master in Finance from Boston College and GGa Degree in Business Administration and MBA from ESADE in Barcelona. Steve joined Fidelity in 1992 as an analyst in the High Income group, where he followed a variety of industries, but focused on distressed and bankrupt securities. In 1995, Steve joined Fidelity International Limited, in London, where he was responsible for establishing a credit process for the fixed-income group. In 1997, he returned to Boston in the Equity Group, and assumed the position of portfolio manager of Fidelity Select Environmental Services Portfolio in 1997. In October 1998, he was named portfolio manager of the Fidelity Investment Portfolio. In 2002 he assumed responsibility of all of Fidelity REIT institutional accounts. In 2004, Steve launched Fidelity's Global Property Securities efforts with launch of the Fidelity International Real Estate Fund, and later the FF Global Property Securities Fund. Born in 1967, Steve received a bachelor of arts degree in finance and German literature in 1990 and a master of science degree in finance in 1992, both from the University of Wisconsin. Olivier Elamine is one of the founding members of alstria Office REIT-AG and became CEO of the Company in November 2006. Prior to the founding of alstria, he was a founding Partner of NATIXIS Capital Partners Ltd. (NCP; formerly IXIS Capital Partners) from 2003 to 2006. He participated in more than EUR 6bn of pan-European real estate transactions and led all the acquisition which form today alstria’s portfolio. In 2003, Olivier Elamine joined the Real Estate Investment Banking team at CDC IXIS as a Director and was one of the founding members of NATIXIS Capital Partners Ltd. In 1998 Olivier Elamine joined Ernst & Young as a consultant in the real estate industry and from 2000 to 2003 he headed the Sales & Leaseback advisory team. Antoine Frey, CEO and founder of FREY based in Reims, France, holds a postgraduate Degree (DESS) in town planning and construction from the University Robert Schuman in Strasbourg, France. Antoine Frey set up FREY in 2008 and introduced the Group on the Paris stock exchange as a French REIT (SIIC) listed company. Over the years, Groupe FREY has become one of the major actors in the French commercial real estate sector, specialised in retail parks and owning more than 800 Million Euro equity in 100 % owned retail parks in France and Spain. From 2008 through to 2014, Antoine Frey has won several REIT (SIIC & SIEC) Awards from the French Industry and been nominated in 2008 ‘Pierre d’Or‘ as Developer and in 2014 as Manager. Pat has been Chief Executive of Green Property Group since December 2008, and in 2013 cofounded Green REIT PLC with Chairman Stephen Vernon. He was responsible for building a €7.5bn assets under management business during the downturn in partnership with Banks and Private equity. Prior to Green, Pat was on the European Board of CBRE having sold his family business to the group in 2006. Alex has been involved in research and transactions in the global listed real estate sector for over 30 years. His career has encompassed award-winning sell side research (BZW), investment banking (CSFB), private equity (Apax Partners Capital), and fund management. He formed AME Capital in 2002, which developed a proprietary database and analytical tool for all listed real estate companies and real estate securities funds globally. This business was sold to Macquarie Securities in 2008, where he stayed for over three years as Head of Global Property Securities Analytics. He formed Consilia Capital, a real estate investment advisory firm, in 2012, and has developed an international institutional client base, as well as publishing regularly in academic journals. Consilia Capital produces a monthly publication, based on the performance of real estate, infrastructure and real asset funds, which features academic papers of interest to practitioners. He is a member of the EPRA Research Committee, the Editorial Advisory Board of the Journal of European Real Estate Research, and was Chairman of the IPF Research Steering Group which sponsored the report on Real Estate Allocations within DC Pension Schemes in the UK. He is an advisor to Investec Asset Management, working with the Multi-Asset team, and is Chairman of the Investment Committee for the Investec GSF Global Real Estate Securities Fund, which he has been involved with since inception. In 2015 he was appointed a Visiting Professor at Henley Business School, University of Reading, and in 2016 he was appointed a Visiting Professor at Cass Business School, City University, London. Jonathan Murphy is the CEO of Assura and was previously the Finance Director, having joined the Group in January 2013. Jonathan was previously Finance Director of the fund management business of Brooks Macdonald Group plc, having joined as a result of the acquisition of Braemar Group plc in 2010, where he was Finance Director for four years. Jonathan was previously Managing Director for the property management business of Brooks Macdonald. His earlier career included commercial and strategic roles at Spirit Group and Vodafone. Jonathan qualified as a Chartered Accountant with PricewaterhouseCoopers, holding management roles in both the UK and Asia. Jonathan holds an MBA from IESE, the leading European Business School in Barcelona. Marcus is a fund manager in the property equities team. He joined Thames River Capital (now part of BMO Global Asset Management) in October 2004 from Henderson Global Investors, initially managing the direct property portfolio within TR Property Investment Trust and latterly managing a number of UK and pan-European real estate equity funds, including the Henderson Horizon Pan European Property Securities Fund. Prior to joining Henderson, Marcus was an investment surveyor at Knight Frank and was made an associate partner in the fund management division. He qualified as a chartered surveyor in 1992 and has a BSc (Hons) in Land Management from Reading University. François Trausch joined Allianz in January 2016 as global CEO for Allianz Real Estate. Allianz Real Estate is the global real estate investment and asset manager of Allianz, developing and executing tailored portfolios and investment strategies worldwide for the various insurance companies of the Group. Starting with a direct equity portfolio of ca. EUR 16bn in 2008, Allianz’s real estate AUM grew to €50bn as of 31st of December 2016 – across direct and indirect equity investments as well as senior debt financings. Last year Allianz Real Estate invested and financed for close to EUR 6bn. Prior to this position, Francois Trausch was CEO of Asia Pacific for GE Capital Real Estate and also served as President & CEO for GE Capital Real Estate Japan. He held earlier GE leadership roles in Western Europe and France, and had previous assignments in acquisition, risk and asset management. Before joining GE, Francois Trausch worked for Tishman Speyer in New York and Berlin and Goldman Sachs in London. He earned a business degree from ESCP in Paris and an MBA from Harvard Business School. He is a ULI Trustee and member of the ULI Europe executive committee. Joost Uwents joined WDP in 1999 as CFO. Now, he is executive director and CEO since 2010. Together with Tony De Pauw, he forms the WDP executive management team. He is a commercial engineer and holds an MBA. He has ultimate responsibility for financial policy, internal reporting, commercial policy and investor relations. Recently, he became an independent non-executive director of Xior Student Housing. EPRA CEO Dominique Moerenhout reviews the achievements of 2018 and looks forward to the challenges that 2019 will bring. At the end of the report you can find the auditor’s report and the consolidated financial statements of EPRA for 2018. EPRA CEO Dominique Moerenhout looks back at 2017 and his first year at the helm of the Association. 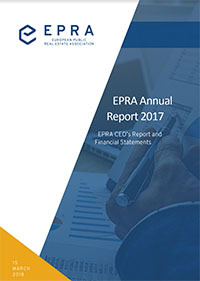 At the end of the report you can find the auditor’s report and the consolidated financial statements of EPRA for 2017. EPRA Chairman Christophe Cuvillier and EPRA CEO Philip Charls look back at 2016 and report on several very positive developments despite a cloudy outlook for the world economy and geopolitics. 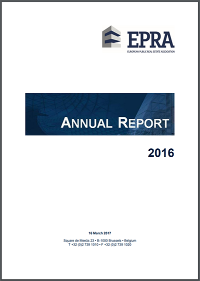 At the end of the report you can also find the consolidated financial statements of EPRA for 2016. Guidelines which stipulate the organisation of Epra's Board of Directors and Advisory Board.